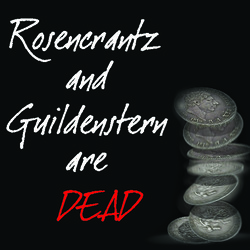 Rosencrantz and Guildenstern are the college chums of Hamlet. Their story is what happened behind the scenes in Shakespeare's play. What were they doing there in Elsinore anyway? "I don't know; we were sent for." Rosencrantz and Guildenstern are fools adrift in a world that is beyond their understanding. Their own memories are unreliable and they routinely misunderstand each other as they stumble through existential arguments. They often state deep philosophical truths during their nonsensical ramblings, yet they depart from these ideas as quickly as they come to them. Ever confused, they even have a hard time recollecting which of them goes by what name. The Players come and go; Prince Hamlet comes through treading words, words, words; foul deeds are done; Hamlet is sent abroad and escapes death; and in turn Rosencrantz and Guildenstern find their "only exit is death." Winner of both Tony and NY Drama Critics Circle Awards.